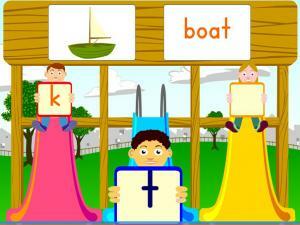 This page is useful for children or adults learning the sound of English letters. Create words based on the sounds and pictures you hear! Some knowledge of English vocabulary is useful, but not absolutely necessary to enjoy this site. Good practice for A-Z phonics. Happy Learning! Have fun playing Alphabet Bingo. 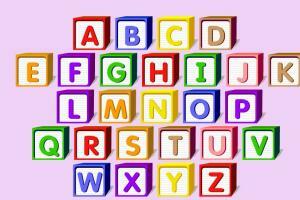 You can play with letter names or letter sounds and upper or lower case letters. There are also 3 sizes of bingo card to try. How quickly can you get a full line? You get a report card at the end to see how well you did in the whole game. 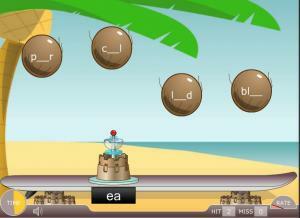 In this game you need to match the pictures with sounds. Listen to the letter and choose the picture that starts with the same sound. For example, if the letter is 'd', then you click on the picture of the doll. This is a fun game where you listen to words and match the two pictures that begin with the same sound. 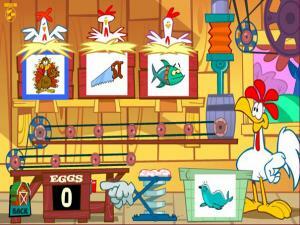 How many eggs can you collect? 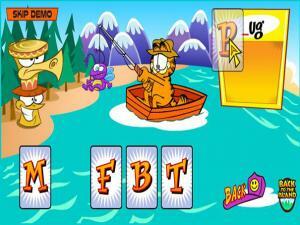 Help Garfield catch objects by matching the missing letter for each word. 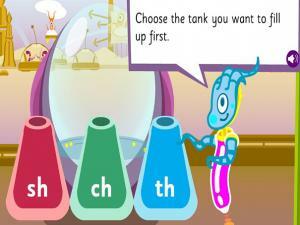 Select your level and whether you want to test yourself on words that begin or end in consonants. Happy fishing! 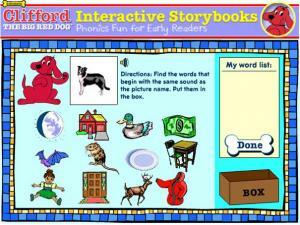 Help Molly open the treasure chests by choosing the sounds that make up the words. You can choose your ability level (Medium, Hard, or Really Hard). Listen carefully to the words and click on the correct sounds. 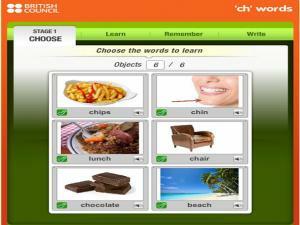 Practice reading English using the phonics method for ultimate success. A great video going through all the sounds of the alphabet first, and then showing simple words and letter combinations. Lots of games and chances to practice all the sounds you learn! 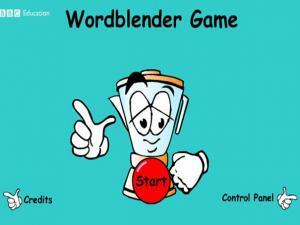 Help Wordblender by choosing the start and end sounds for each word. Press 'GO' to find out if you're right! At the end of the game you can print all your words and keep them. 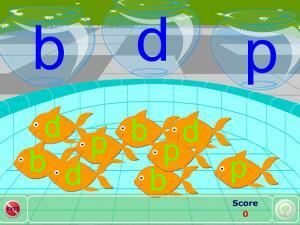 Can you put the fish into the correct bowls by matching the letters? 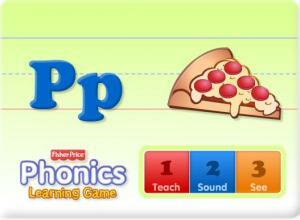 This game helps you practise the similar sounds of 'b', 'd' and 'p'. 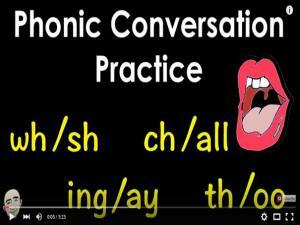 This video is vocabulary-based for conversation practice using the sounds "wh - sh - ing - ay - ch - all - th - oo". 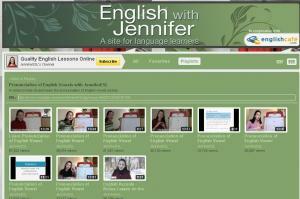 The video has open slots for vocabulary substitution practice which allows you to practice on your own as well. Sort the words to clean up the garden! Listen to the last sound in each word and place the leaf in the correct basket. There are several rounds to play and the sounds get harder and harder! 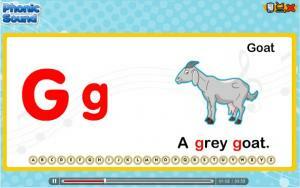 This kids' site includes animations and songs about the pronunciation of the English alphabet. There is a separate section for the short versions of the five vowels. 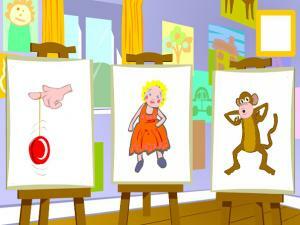 Your child will enjoy clicking and watching these animations while learns English phonetics. You are given 3 words to listen to and one individual letter sound. You have to decide which word starts with the letter sound. You can roll over the beginning sound to hear it again and roll over the pictures to hear their names. 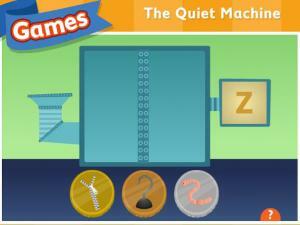 Once you think you know the answer click on the picture that starts with that beginning sound and see if you have added the sound to The Quiet Machine! 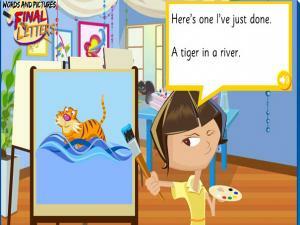 This is a collection of 7 games for children learning to read in English. Not all the games are practical, but they are all fun! "All About Me" and "Tongue Twisters" are especially helpful for practicing reading and pronunciation. Listen carefully to the word and see if you can her which letter is missing. Move the mouse over each letter to hear what it sounds like. When you think you know the answer click on the letter to hear the whole word. Once you have got the right answer, move on to the next word! This page helps you practice pronunciation of all 26 letters of the alphabet while you learn new words. 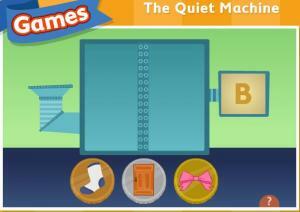 Select item that begins with the letter shown, for example, "bow" starts with B. How many can you guess correctly? 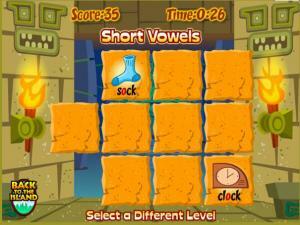 This game has three modes to help your child learn English letters. The first mode is teaching mode, where your child repeats the sounds they hear. In the second mode your child will listen and choose the sound they hear. Then, in the third mode they can test their knowledge of the vocabulary they've learned as well. An excellent tool for young children learning English. 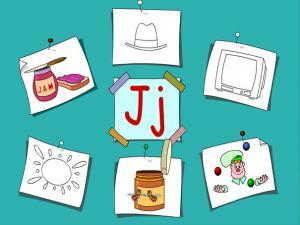 Learn the letters of the alphabet and the sounds they make in this lesson. Review at the end by matching the sound with the letter! Blend beginning sounds and ending sounds together to produce a word. See if you can work out the word before the two football players collide! Click on a letter to see six pictures, then click on the three pictures that begin with the letter you selected. Listen to the sounds again to check whether you have got every word right. Practice sounds and phonemes in English. Click on a cadet to hear their letter. Then listen to the Captain and find the cadet with the same word. Can you earn all 8 stars? Find the words that begin with the same sound in the box. This game tests your listening and vocabulary skills. 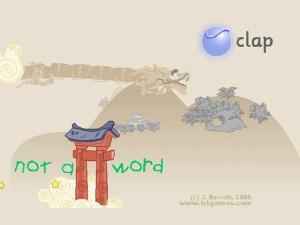 Direct your dragon with the mouse and catch the globes with real words. Choose the phoneme that you wish to work with. Listen to each word (there is a picture to help you know what it means). Which letter is missing? 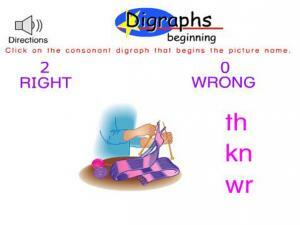 Good phonics practice for children or perhaps beginning adults. 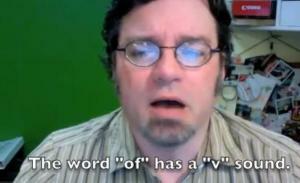 An English teacher explains how to pronounce "of" and "off" in this video lesson. One of these contains the "f" sound while the other uses the "v" sound. 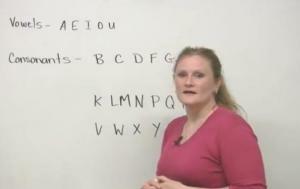 Learn the English alphabet and phonetic pronunciation in this lesson. Click on each wagon and listen! 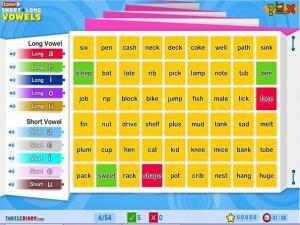 Review your knowledge of English letters and phonics in this memory game. Improve your pronunciation by matching the picture with its phonetic sound. Learn how to pronounce the letters of the English alphabet — essential for telling people your email address, and sometimes even your name. If you learnt English in a school, this might have been one of your first classes, but people who have learnt by themselves often don’t know how to correctly say the letters. 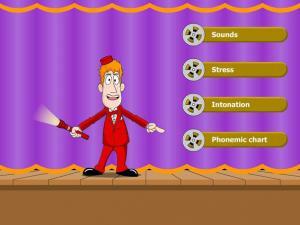 This is a fun, interactive game to practice your speaking and listening skills. Listen and choose words with the same two last letters to make a picture. This is a great site with 3 different games to try. Start with Beginner letter sounds and then progress through to short vowel sounds and then long vowel sounds. 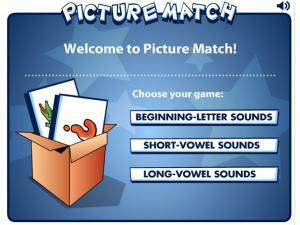 In each game, match pictures to the letter sounds by clicking and sorting them into boxes. You can hear the word as many time as you need. There are 15 words in each game. A great resource to practice all the main sounds and phonemes in English. You can play with all phonemes, or just one group with similar sounds to make sure you really know the differences. Listen to the word and click on the sandcastle with the matching word. Try and build your own sandcastle as quickly as possible! 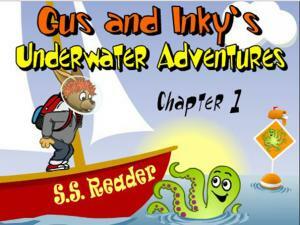 Follow the story as Gus decides to go and visit Inky. Help Gus with beginning sounds of words and phrases before he leaves. 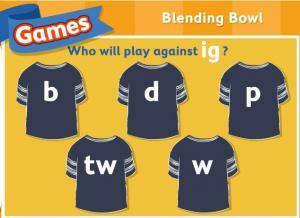 An initial blends game on br, dr, pr, cr, tr, gr, and fr. Listen to the words and sort them according to their initial consonant blend. This game tests your listening skills, as well as teaching you to recognize the sound that pairs of consonants create together in a word. 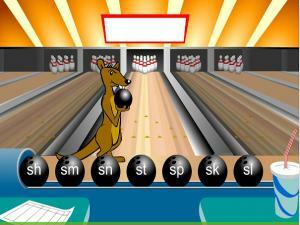 Listen to the word and choose the correct bowling ball that shows the sound at the beginning of the word. You can hear the audio as many times as you need. 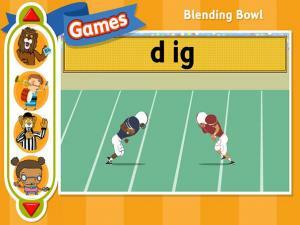 This game helps you practice words that end in the consonant blends '-nt', '-nk', '-ng', & '-nd'. Listen to the consonant blend and the word. Select the correct pair to complete the word. Match the pairs of sounds. There are 5 levels on this site, giving you practice with short and long vowels, digraphs, dipthongs and "vce" (vowel-consonant) patterns. This is a phonics challenge! Choose one of the five vowels 'a', 'e', 'i', 'o' or 'u' to practice and the game will select long or short forms of the vowel. 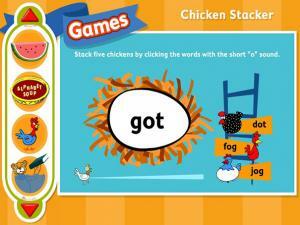 Listen and find the words that match the vowel sounds and stack 5 chickens in a row! The game will let you know if you missed a word so you can learn for the future. 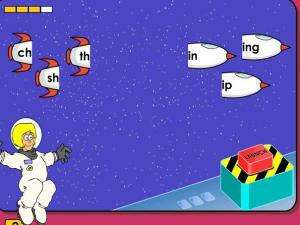 Practice long vowel sounds and help the Prince rescue the Princess! 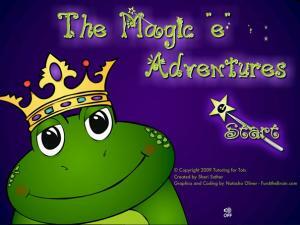 Click on the words and watch as the frog-Prince makes his way to the castle. Read the words, listen to the pronunciation and make sure you get the right spelling! 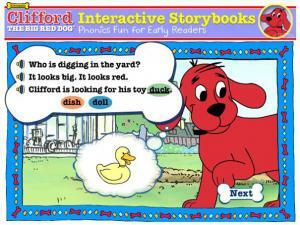 A fun, interactive story to practice your reading and phonics skills. Click on the bone to begin! Open the doors (by clicking) and decide if the item behind the door begins with the same sound as the main item. 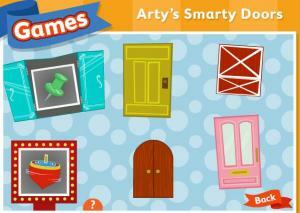 Arty will pronounce each word for you, but it will be difficult if you do not know many English words. Give it a try and enhance your pronunciation! This game tests you on syllables. 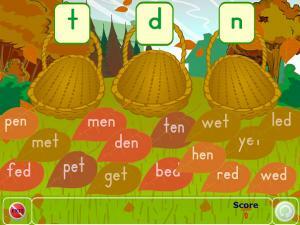 You have to work out how many syllables are in each word and click on the number that matches your answer. 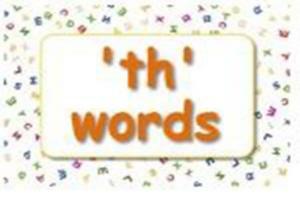 The audio is good and will highlight the different syllables with the correct answer. 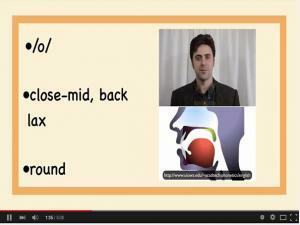 Watch this short pronunciation lesson on the pronunciation of the vowel /o/. There is a great illustration of how your mouth and tongue should move to produce the correct vowel sound and then some words for you to listen and repeat to give you practice with the new sound. This is an engaging grammar exercise designed to help learners identify words with short and long vowel sounds. 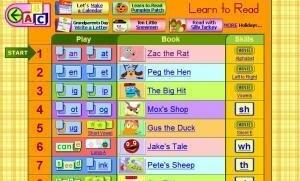 Pick a color according to the color-vowel key and fill each word block according to the long and short vowel sounds. This is an interesting way to build your vowel identification skills! 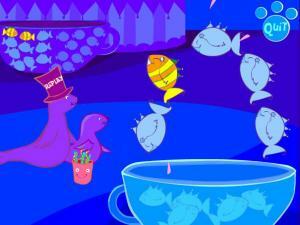 Help the seals collect some Flashy Fish! Listen to the main word. 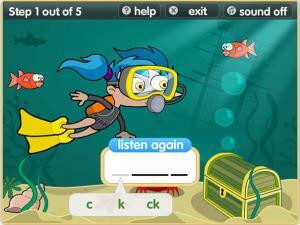 Then listen to the 5 fish and select the one that starts with the same sound as the main word. If you need to hear the main word again, just click on the seal, or any of the fish to repeat their word. Get it right and get a flashy fish! 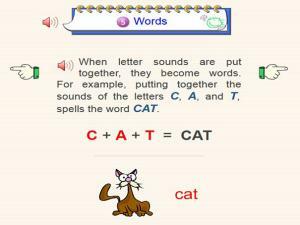 This site gives you full instructions and help with sounds, stress in words and full sentences, intonation and has a complete phonemic chart with good audio. 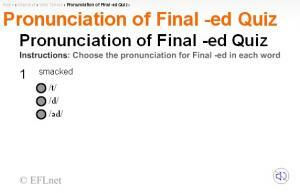 Very useful to help correct your pronunciation and practice your speaking. 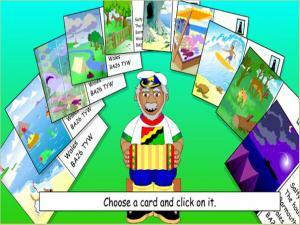 A game to help you identify phonemes while helping to write a postcard. 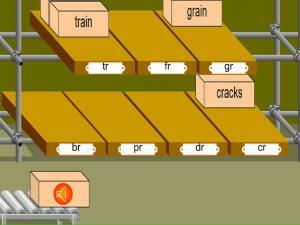 Highlight the vowel phonemes in each sentence by alternately clicking on them or by clicking and dragging the right spelling into the gap in the words. Each postcard tests a different phoneme. When you have finished, you can print out your complete postcard. Can you help Captain Armstrong join the rockets and blast them off? Listen to the word she says and click on the rockets to make the word. If you are correct, watch your rocket launch! 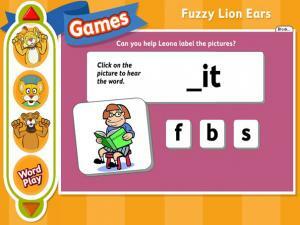 A fun phonics game! 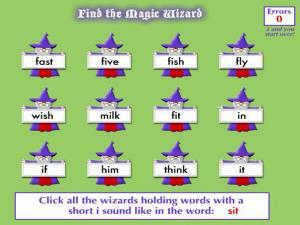 Click all the wizards holding words that sound like the word provided. Can you find all the correct magic wizards? 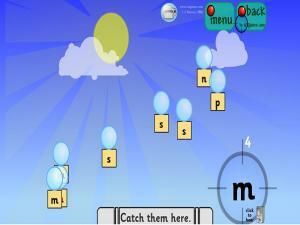 This phonics game gives you practice in the sounds 'long O and silent E'. 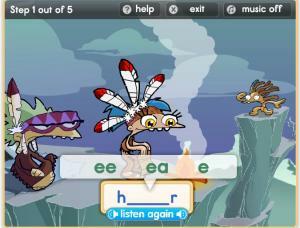 Listen to the sound, then drag and drop the correct letters to spell the words. Limericks are short poems. They are used here because they have good examples of the contractions and weak forms typical of spoken English.These exercises will help you to produce English sounding sentences, and to be able to control the rhythm and stress of what is said. This game goes through the sounds of letters and helps you recognize the difference between similar sounding letters, such as 'm' and 'n'. 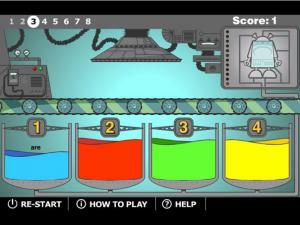 Try to pop the bubbles so you collect the letters in the container at the bottom of the screen. This is a fun game that you play against other people online! 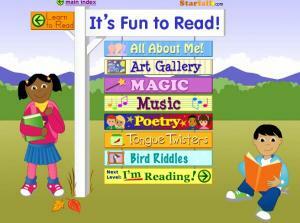 It helps you with general word recognition, reading and listening skills. Choose your kitten and race as fast as you can. Listen to the word and then click on the ball of string to move forward. 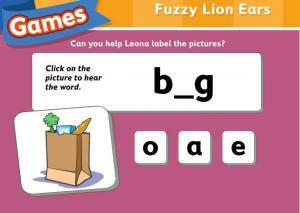 This page for kids includes games about English letters, focusing on the sound of each letter. Some previous knowledge of English vocabulary is necessary to fully enjoy these games. Click "game" to get started. 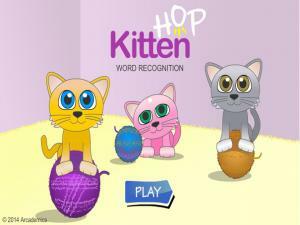 Practice phonics and learn new words with this cute, fast game. 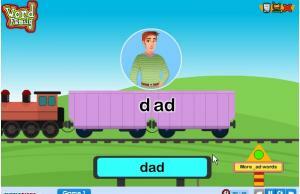 Choose a "player," a syllable, and match it to other letters or syllables to form new words. Good pronunciation practice for kids or patient adults. 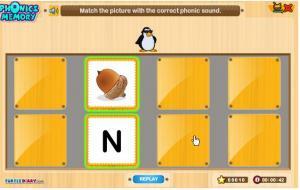 Click on the consonant pairs that shows the right sound for what you can see in the picture. Whether you're currently enrolled in a language program or not, take advantage of free online instruction from an experienced teacher via this YouTube channel. 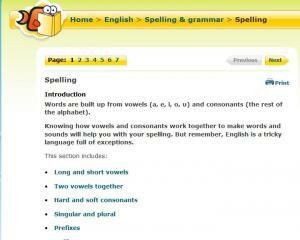 The lessons include detailed instructions on pronouncing English vowel sounds. Excellent resource for anyone wishing to improve their pronunciation. All the sounds of English are represented by linguistic category, click "Play" to hear the sound and see how you should move your tongue and teeth to reach the sound of an English native. 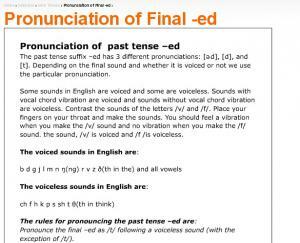 Describes how to pronounce the past tense suffix '-ed'. There are two exercise at the end with explanation. Listen to the words and help Molly send a smoke signal by choosing or writing the correct letters to fill the gap. Practice your auditory comprehension and spelling skills! You get to choose easy, medium or difficult level questions. This is Dave Sconda's YouTube Channel. 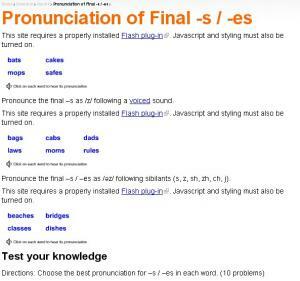 Here, the experienced ESL instructor has posted lessons about North American English pronunciation. These videos include video effects and some humor, so they're not boring. There are several topics available, focusing mostly on hard-to-pronounce sounds for ESL learners. Coconuts with words in them fall to the beach and you must match the missing letters to the correct word coconut. If a coconut reaches the surfboard before you blast it, your stage will end. 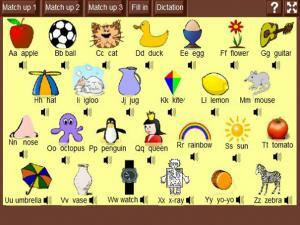 A great reference site for all the different phonemes in English. Each card shows examples of words that have the same sound/phoneme so you can practice the pronunciation and learn which words sound the same. Use this as a quick reference or a check to see that you are pronouncing a new word correctly! You can play this game with up to 4 players! 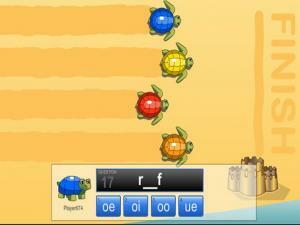 Fill in the missing letters for the word provided to move the turtle(s) to see who will win the race. All the letters are double vowel sounds. An exercise on the pronunciation of past tense suffix '-ed'. English is based on phonetic sounds, not letters. Dictionaries use these sounds to describe the pronunciation for each word. 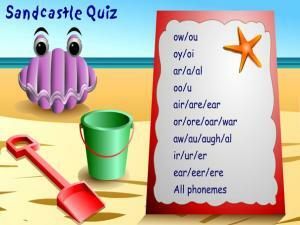 This lesson helps you to practice the phonetic sounds used in good English pronunciation. Perfect for all levels: elementary to advanced. 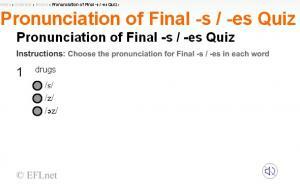 Explain how to pronounce plural nouns ending with -s or -es. An exercise is provided with explanation. An exercise on pronunciation of plural nouns ending with -s or -es. 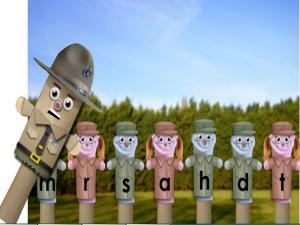 A fun site for students with experience in the phonetic symbols of English. Play games to practice your knowledge of the phonetic symbols and the phonetic transcription of English words in UK pronunciation. Learn the phonetic symbols of the English language and improve your pronunciation! 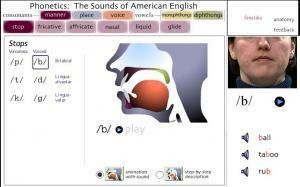 This site includes videos about the phonetic symbols of English, which help you learn to distinguish between similar sounds. Also included are interactive and downloadable exercises for practice as well as quizzes and audio/video lessons! 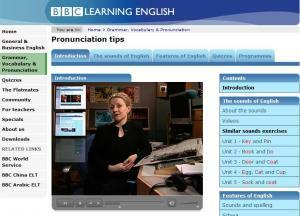 Improve your English with the BBC team using this complete series of videos and activities to help you improve your pronunciation. This is a fun site that provides phonic tutorials with full audio. The lessons can be heard by clicking on the speakers and highlighted words. 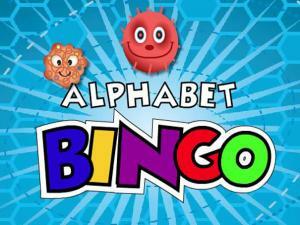 Included are the names of alphabet letters, consonants, vowels and vowel rules, letter blends and common words, along with many pictures to enjoy.